Adopting a dog when you kids in the family is significantly different when you're living by yourself, or just with a partner. 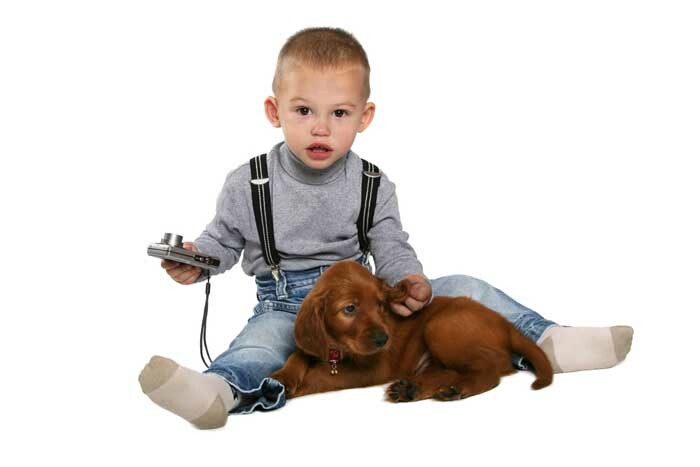 There are many aspects of kids and dogs relationship to consider, no least of which is safety. We'll discuss some of the best dog for families with kids below, and why these breeds are best. Before we dig into the list, I highly recommend doing some due diligence on how adopting a dog will impact your living situation when you have children at home. The best thing about this is that studies show how babies are healthier when dogs are around, and how kids grow up without allergies in the presence of canines. 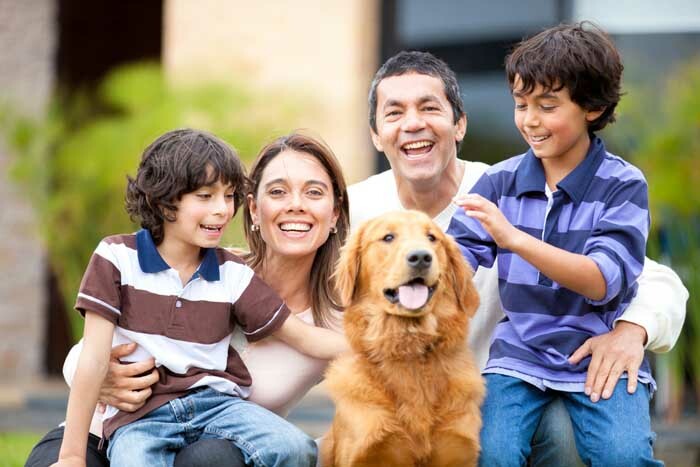 Adopting dogs for families with kids will have a great deal of benefits for everybody involved, as long as you know how to teach your kids to behave around dogs and train your pets accordingly. Now, let's take a look at the best breeds for families with kids. Majestic and beautiful, Bernese Mountain Dog is a pretty tall dog breed, even though most of them look kind of stocky. BMDs are very sturdy dogs, which means they're also great pets for families with kids. They're large and capable of doing a lot of hard work. The rich, thick, gorgeously dark and somewhat long coat of Bernese Mountain Dogs will require a moderate amount of grooming. It's slightly wavy and provides them with great insulation in colder climates. This breed also likes to run around, work and spend a lot of energy. In terms of character, BMD are one of the best dogs for families due to their calm nature, very easygoing attitude and a devoted companionship. These dogs are said to be pretty sensitive but very loyal to their owners, including kids. Bulldogs are easy-going, patient, and sturdy. 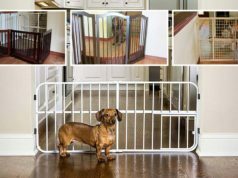 They can put up with anything kids might throw at them, and aren't particularly demanding when it comes to attention, grooming, or exercise. Bulldogs aren't very difficult to train, and especially when they are puppies, you can find ways to quickly housebreak them. You will need a good strategy and some knowledge of Bulldog's attitude and character to understand the best approach for training them. However, they aren't the most graceful of beasts, so make sure you don't mind some slobbering, drooling, or even flatulence. Bulldogs can be expensive. Bulldog puppies can fetch $1000 or more, and bulldogs are prone to health issues later in life, leading to big vet bills and a shorter lifespan. Even though Boxers often look very aggressive and scary, they are actually one of the best dogs for families because of their protective attitude, strength and agility. This breed is very playful with owners, and absolutely adores kids. Boxers will protect their owners and your children no matter what, while at the same time being very gentle to kids. Their exuberant, devoted and attentive attitude is what makes them a great family pooch. However, Boxers can get pretty aggressive towards other dogs or animals, unless you grow them as puppies and spend enough time fixing or preventing potential dog behavior problems. Beagles are very energetic. They can easily keep up with kids, and are gentle with everyone. Their short coats are easy to groom, although some do have a tendency to get dirty during playtime. Beagles need exercise, and lots of it. Under-exercised beagles frequently develop weight problems, which lead to other health problems later in life. If they are frequently bored, they might take it out by baying, howling, or destroying things around the house. Interestingly, Beagles are also one of the most popular choices among eco-friendly dog owners. If you have a yard for your beagle (and you should), make sure it is fenced. Beagles are curious little explorers, and will wander off in search of adventure. Beagles can also be stubborn, so might take a little longer to train and housebreak. Beagles can definitely be a handful. If you're thinking of getting one, make sure you have plenty of time and patience. Bull Terriers have a very distinct appearance. Their intimidating physique makes them useful guard dogs, even though they are in fact quite docile and playful. They enjoy lots of boisterous play, and can certainly keep up with rowdy children. In fact, their style of play can be too much for some people. This can be problematic in public, as strangers are often intimidated by their apperance. They can also be aggressive towards other dogs or cats, so they might not be a good fit for a family with other pets. Bull Terriers shed quite a bit, and tend to be very strong-willed. If under-exercised or bored, they can develop destructive habits. However, most dog owners have noticed that these Terriers change their attitude for the better once spayed or neutered. Collies are kind, respectful, and intelligent dogs. They enjoy training, and are eager to please. They are lively, but don't require quite as much exercise as the very active breeds. They also make good watch dogs, since they are very alert, but they don't tend to be aggressive. Collies are of course one of the most beautiful dog breeds, and require plenty of grooming attention. For best results, it also doesn't hurt to take your Collie to dog training experts to prevent any future caprice behavior. Although they don't require an outstanding amount of exercise, collies do require a fair bit of attention. They are highly intelligent, and if they aren't stimulated enough they can develop destructive habits. They are very social, and may develop separation anxiety if left alone on a regular basis. Their long majestic coats also require an appreciable amount of maintenance. Newfounlands are gentle giants. They have very sweet, steady temperaments, and respond well to training. They are typically very fond of kids, making them a natural choice for families. They are, however, big, furry, slobbery dogs, so make sure your family can handle that. They're not the most perfect animal for dog traveling and adventures, but are great if you choose to leave them at home with kids. Newfounlands are very social dogs, and won't handle loneliness well. When you are around, your Newfoundland will want to be as close to you as possible, which sometimes means sitting on your feet, lying on your lap, or leaning against your legs. A very famous and currently “trending” dog breed, Pugs are definitely one of the best dogs for families with or without kids. This small, well-proportioned, square-like and sturdy breed will sustain most damage from kids and still love them no matter what. Pugs don't shed a lot and do not require constant bathing like some other pets. Pugs are also known to be very funny (unintentionally) and know how to always amuse kids. They are great family pets because of their calm, amiable and always playful attitude. 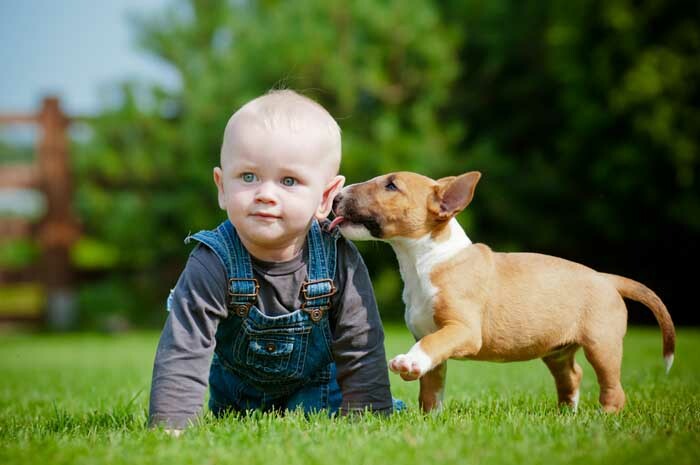 These dogs are extremely active and extremely affectionate, making them a great fit for active kids. They take well to training, and are often bred for obedience competitions. In fact, this breed is generally only bred by responsible breeders, so you can be confident that you are getting a healthy dog with a good, predictable temperament. Vizslas are not one of the best hunting dogs (which is what they're known for), but are also amazing with kids and love them dearly, which is one of the primary reasons pet owners often choose them and what makes them one of the best dogs for families. However, these dogs require lots of time, attention, and exercise. When their intellectual, social, and physical needs are met, these dogs will make excellent family pets. If their family doesn't have enough time for them, these dogs are prone to developing separation anxiety and destructive behaviours. A breed that undeservedly earned a bad name is finally beginning to become more popular and understood among dog owners. Staffordshire Bull Terriers are one of the best dogs for families because of how little it takes to take care of them. Staffs, as they are often called, are not tall but rather longer dogs. They are very sturdy and powerful animals with great agility and heavy musculature. They shed moderately and have a smooth and short coat that's easy to groom. Staffordshire Bull Terries are also great with children and love having fun. They have amazing character, are always playful, adventurous and caring. Contrary to popular belief, if raised right, these dogs are very amiable, friendly and sociable. They can love other people around you, and other dogs as well. These dogs are well-rounded family dogs. They are active, but not as much as Beagles. Their beautiful coats require some maintenance, but not as much as Collies'. They are good-natured and affectionate, and take well to children. They are, however, very sociable dogs, and do not take well to prolonged loneliness. You'll have to “entertain” your pooch to an extent, and socialize and play with them on a regular basis. Irish Setters are one of the best dogs for families with kids, and also one of the most famous dog breeds around. They love regular activities and are always on the lookout to play. Often forgotten dog breed, Keeshonds are actually one of the best dogs for families because of their sturdiness and well-proportioned size. This Northern canine is a great pet for any pet owner. They're considered a talented dog breed. Keeshond is a clean and brisk dog that doesn't need a lot of grooming, but certain attention to keep them fresh will be required. Their long coats are a little harsh, provide them with great insulation, which makes this canine breed perfect for colder temperatures. Keeshond is certainly a family dog and perfect for any household. They have moderate levels of energy, are playful enough to be good with kids, are loving and always ready to explore new things. Keeshonds also learn quickly. Poodles are a great choice for a family with allergies, as their short, curly coat barely sheds. These gentle, lively dogs are one of the most intelligent breeds, making them quite trainable. They're one of the smartest dog breeds around, too. They do need lots of exercise, and their pent-up energy can manifest as excessive barking and jumping. These intelligent animals are also quite emotionally sensitive, and will get anxious from fighting and arguing in the household. Labs are one of the most popular dog breeds around. Cheerful, gentle, and intelligent, these dogs are a great choice for just about any lifestyle. They are eminently trainable, and very eager to please. Labrador Retrievers are some of the best dogs for families because of their caring attitude and loyal companionship. They love kids and their owners alike, and will be very protective very protective of small children. This is an intelligent breed that can be trained fast, too. The major caveat for this breed is simply their exercise requirements. Under-exercised labs can get rambunctious or destructive. One of the largest canine breeds out there, Great Danes are definitely one of the best dogs for families for many different reasons. This massive, powerful yet elegant dog has a well-balanced behavior. Surprisingly, Great Danes are very calm and are one of the most perfect dogs to have in an apartment, let alone if you live in a house. Their short and glossy coat doesn't require a lot of grooming, and Great Danes do not shed a lot as well. Great Danes are very gentle dogs who love their owners and anybody who the owners are friendly with. This breed is always very protective of children, and despite their threatening size, Great Danes are sensitive and easygoing pets. 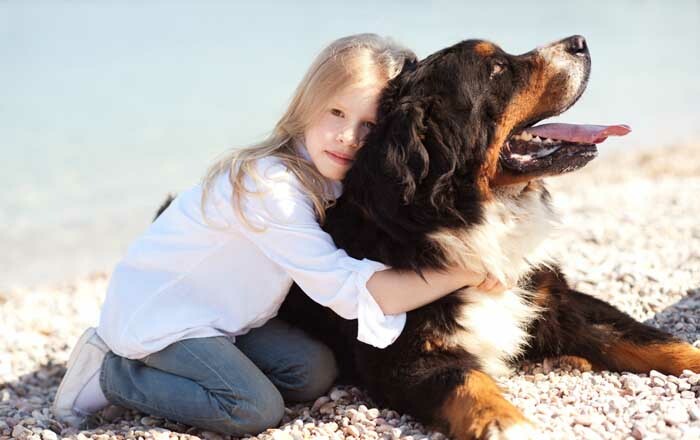 They love children, but kids might often be scared of the dog due to their size. Of course, one of the most popular dog breeds ever, whose puppies are always the center of attention, are Golden Retrievers. These are beautiful, intelligent, caring and loving dogs. Golden Retrievers are very similar to Irish Setters and also one of the best dogs for families, especially for those with kids. They have world-class patience, making them an excellent choice for a family with younger children. Golden Retrievers do tend to have shorter lifespans, however. Consider how old your kids will be in ten years or so, and whether they will be ready for this life lesson.